You're reversing your vehicle. What should you do while the audible warning device is operating? You're reversing your vehicle. What should you do while the audible warning device is operating? Your job as a bus or coach driver is to provide a smooth, safe journey for your passengers. There may be times when you can’t maintain the timetable or schedule due to events outside your control, but you should not compromise the safety of your passengers. Be courteous when dealing with them. Look people in the eye when you issue tickets and give a smile. Give your passengers time to get seated, help them if they are unfamiliar with the service and when you stop, stop close to the kerb. Common courtesy will ensure repeat business and customer satisfaction. A bus driver must not drive while issuing tickets, the doors are open, or giving change. On regular services, traffic congestion can soon put you behind schedule. Nevertheless, you have a responsibility to your passengers at all times not to take shortcuts or jeopardise their safety. They are paying you for a service which must always deliver them safely to their destination. Smooth acceleration and braking not only improve passenger comfort but also create less wear and tear on the bus and improve fuel economy. Large vehicles are more stable in a straight line under gentle acceleration. If you accelerate sharply passengers will be thrown backwards in the bus. If passengers are still in the aisle when you pull away because the bus is full and there’s standing room only, do so gently. Or wait for all passengers to be seated otherwise you can cause injury. Braking sharply will throw passengers forward. When approaching hazards or bus stops you should always be aware of what your passengers are doing – they might have got out of their seats early. Late, harsh braking as they leave their seats can take passengers by surprise and cause them to fall over, possibly injuring themselves or others. Plan well ahead so that you can brake smoothly and in time. For example, if you see a green light ahead in the distance there’s a chance it will be red by the time you get there, so adjust your speed so that you don’t have to brake sharply. Taking a bend too fast will throw passengers sideways towards the outside of the bend. This makes the bus more unstable which makes steering through the bend more difficult. Passengers are most likely to notice weight transfer when braking or going around corners. Young and old passengers are most at risk of falling on a bus, and older passengers are most at risk of being injured if they fall. Older passengers may leave their seats early because they don’t want to hold you up at the bus stop. A bus driver is responsible for the safety of passengers on board. Anyone standing on an open platform is at risk should the driver have to brake suddenly or take a corner at speed. If you pull up to a bus stop and the stop is blocked with another bus, you can stop behind the bus ahead however, before you open the doors you must check for traffic to the left, especially if you have not been able to park near the kerb. Watch for cyclists riding up the nearside. Many newer buses have an additional mirror that allows you to see the position of your front wheel in relation to the nearside kerb. An air suspension system gives a more comfortable ride to passengers and an even height, as well as reducing the wear on road surfaces – it’s also called ‘road-friendly suspension’. Use interior lights at night so that passengers can move around safely if they need to – don’t leave the interior in darkness. If there are no passengers you can turn off the interior lights. Priority seating on buses is designed for passengers with disabilities. 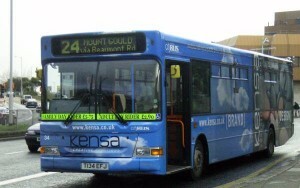 All buses and coaches since 2000 must be accessible to people with disabilities. If a disabled passenger is getting on the bus and they tell you that they can board without assistance then you don’t need to give them assistance. Give them their independence and dignity even if it takes a few seconds longer. If they say they can manage but are obviously having problems, smile and ask what you can do to help them. A passenger with a white cane with a red ring painted on it has visual and auditory impairments. Be prepared to ask if they need help should they appear to be struggling. When dealing with passengers with hearing difficulties it’s important you look at them when you are talking to them. Passengers that have difficulty walking should be allowed to sit down before you move away from the bus stop. Kneeling buses are designed to make it easier for elderly passengers and those who have difficulty walking to get on and off. These are hydraulic systems that lower the suspension so that the entrance to the bus is level with the kerb. Don’t forget to raise the bus again before you drive off. If a passenger in a wheelchair wants to access the bus you should only refuse them access if the boarding device fails to work. Don’t risk the health and safety of a person with a disability, or other passengers, by struggling to get them on without the proper equipment. Only someone trained in the operation of the boarding device should use it. As the driver of a one-person-operated double-deck bus you should be constantly aware of passengers on the top deck by using the internal mirror system so that you can see when passengers are about to descend the stairs. If you are driving a double-deck bus, be aware of roads with a steep camber or high crown (i.e. where the centre of the road is much higher than the edge). A road which has a steep camber will slope sharply towards the kerb. You must be aware of the dangers this can present. The nearside wheels will be lower than the offside causing your bus to lean towards the pavement or verge. This brings a risk of collision with objects such as overhanging trees, lamp posts, shop awnings, road signs and bus stop roofs. When driving excursions you may come across narrow roads with passing bays. Be careful of your vehicle’s length in these bays. Be careful also when pulling away if your bus or coach has a high seating position as it means you will have less visibility of objects in front of you and to your sides. You can open your window and look down the side of your bus when pulling away to the right. If your coach is fitted with reversing warning bleepers, don’t use them between 11:30pm and 7am in areas with a 30mph restriction. You will still need to be continuously looking around as you reverse. It’s legal to drive an empty, half-cab double-deck bus, but the passenger access must have a chain or strap to prevent any passengers jumping on board while you’re stationary or waiting in traffic queues. You must not carry any passengers unless there’s a responsible person on board to supervise. If there’s TV and video equipment fitted to a coach it can only be used when it can’t be seen by the driver. If seatbelts are fitted in your bus or coach passengers must wear them at all times. In hot weather you are not permitted to ride with your doors open. Many vehicles have air-operated doors which close automatically when the clutch is released. Do not override this set-up. An open door invites people to make rash decisions to enter or leave the vehicle as you are about to move away, which can be extremely dangerous. As you move away from the kerb, be careful of passengers who may try to board the bus. Before pulling away, check your mirrors for potential passengers who may be running for the bus. Also be aware of passengers who might try to get off the bus as you move away. To avoid passengers jumping off or on the bus while it is moving, wait until you have stopped until you open the doors. Passengers may be in a hurry to get off at their stop. Don’t brake harshly or open the doors until the vehicle has stopped. Passengers may have left their seats early and be standing up waiting to get off. Due to the necessary fittings on board, such as handrails, poles and luggage racks, there’s a substantial risk of injury. Put your passengers’ safety first. If you are parking at a resort where passengers will still have access you need to ensure that the cab area is isolated and that there is a responsible person on the coach to assist passengers. Buses and coaches used for school contract work must have yellow reflective signs. 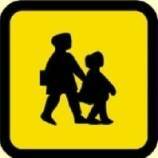 These alert other drivers that when the bus is stopped children could dash across in front of traffic. When you are dropping off or picking up school children you can use your hazard warning lights to warn other drivers. When driving a school bus you must avoid all physical contact with the school children unless in a medical emergency, in self-defence or in order to prevent a serious offence or threat to safety. To work out the weight of your bus, around 15 passengers equals one tonne, although you will need to judge this based on the size of your passengers. With the obesity epidemic it could easily be closer to 10 passengers. You must also make an allowance for any luggage brought on board. Luggage for 50 passengers on a coach could easily reach 1.5 tonnes. A full bus with 75 passengers could be 5 tonnes or more heavier than an empty bus. The unladen weight of your vehicle will be written on the side. Some weight restrictions apply to large goods vehicles (LGVs) only and not to passenger carrying vehicles (PCVs). Look out for a plate beneath a restriction sign that indicates this. Road signs show weight restrictions in various ways, and you should make yourself familiar with all of them, so that you’re in no doubt about their meaning and relevance. If your bus breaks down on the motorway, stop on the hard shoulder and move passengers to the front of the bus in case the bus is hit from behind. The same applies if you break down on a normal road: move the passengers to the front. The location of the first aid equipment, fuel cutoff device and fire extinguisher must be clearly marked in the bus. This video shows you how ferociously a bus fire can burn. If there’s a fire in the upper deck of your bus you should first stop safely, then get everyone off the bus, then contact emergency services. If passengers complain of exhaust fumes in the vehicle you need to stop and rectify the situation as the fumes are toxic and, as well as being unpleasant, will cause a danger to passengers. There are accepted bell codes for use in a bus. Don’t let anyone use them improperly. Four bell rings indicate that someone on the bus considers an emergency situation has occurred. As the driver, you must stop the vehicle safely, with consideration for your passengers, before investigating further. Three bell rings means your vehicle is full. Two bells means move off when it is safe. Your bus or coach might be fitted with a speed limiter. If it is, the speed will be noted in the driver’s cab. If you are the driver of a 1996 bus the speed limiter will be set to 62mph (100kph). Bus lanes are lanes specifically for buses and any other vehicles specified, for example, cycles and motorcycles or vehicles with a certain number of occupants or more. Watch for signs for bus lanes as they will tell you when they can be exclusively used by buses and when not. 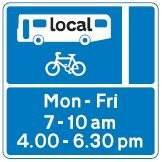 As a local service bus driver you may use the bus lane at any time. The restrictions apply to other road users to keep it clear for you at peak times. Don’t be tempted to speed when driving up the inside of slow-moving or stationary traffic. Be alert for pedestrians who may be trying to cross the road. This shows a with-flow bus lane that can be used by taxis and cycles.